That's all from us for the night - more reaction to come on our football pages. More from Slaven Bilic: "I told the guys before the game on Tuesday that we showed in training we were full of energy. We could not wait for the game to start and I would hope the Brighton game was a one-off. We have composure, players back from injury and this is the standard of play (we expect). "We wanted to put a strong team out tonight, it was an important game for us. A few players were left out but the ones who came in deserved a chance. The team, especially in these moments, is above every individual and we have to be humble. No matter who plays on Saturday, we should not have long noses and we have to fight for the team. "I said I am calm and glad when we win in this way. You see the team is very alive and we are very stubborn in a positive way. There is no time and place to go large now. We have done a lot, but considering the season, we have done nothing." Spurs boss Mauricio Pochettino: "We scored two goals and it looked like the game was over but we showed a lack of aggression and concede three in 15 minutes. "That can't happen. When you are not on the same mental level it is difficult. The opponent had nothing to lose, they started to believe and we started to suffer. "Maybe we thought the job was done. The second half was not the same and it is difficult to accept. "After Real Madrid and Liverpool it was difficult to keep the motivation and concentration. We must be more mature at 2-0 up, that is disappointing. "It is not good to lose, always, I am not happy." West Ham manager Slaven Bilic tells Sky Sports: "The mood was down at half-time but not that down as against Brighton. That result was bad but we played good football. We did not penetrate Spurs enough, were not good in the final third and we said things about what we should do when they and ourselves have the ball. "We reacted in the most brilliant way. To score three goals against them, who do not concede goals, then be brave and compact and good on the ball, we deserved it and it is a big boost for us. "Goals are always key, they give the whole team energy. We did not want to concede the third and then score ourselves. We did that and had more confidence, it gave us rhythm and they got out of rhythm. We kept going, kept pressing and in the second half were closer in midfield to Dele Alli and Moussa Sissoko who are good at breaking forward. It was a really very good team performance." SMS Message: Strong 2nd half from Everton tonight. Pace , energy and desire. Not sure what people think a big name manager will bring pre-transfer window. Unsworth could get the best from this squad. Give him a proper chance. from Chris, Newcastle. Strong 2nd half from Everton tonight. Pace , energy and desire. Not sure what people think a big name manager will bring pre-transfer window. Unsworth could get the best from this squad. Give him a proper chance. Bilic leaned in to Pochettino at the end and something that made him smile, I'm guessing it was "I'm buying you a drink, you just saved my job". Incredible. Good interview from Slaven Bilic, calm and collected. Keen to stress that the players are behind him and they showed that in training yesterday. Moz Chugsy: More promising from Everton with pace and wingmen. Jags not commanding penalty box like he used to. CJed: Let's not get carried away WHU. Spurs threw that away in the second half. Looks good on paper but this is not a season changer. More from Everton boss David Unsworth: "Morgan Schneiderlin was taken ill so I had no hesitation in playing Beni Baningime, he's been terrific for the U23s and that was some debut tonight. He likes a tackle! West Ham captain Mark Noble on Sky Sports: "Don't get me wrong, you need a bit of luck. Andre Ayew knows where the ball is going to drop. He's had a bit of stick but he keeps on grinding and he deserved that." Everton boss David Unsworth on 5 live: "Nobody likes losing games, I'm a bad loser but I have to say I'm proud of the performance, they were terrific. "We are disappointed to lose, we think we had chances to get something from the game. "We knew James McCarthy could only play for 60 minutes so we were always going to change things then. We limited Chelsea and then opened it up. "We were camped in the Chelsea half, there is loads to work on." West Ham's double goal scorer Andre Ayew on Sky Sports: "We stayed confident. We were down but the coach had the words. I want to congratulate the whole team, it's a massive win. We have a massive game on Saturday (against Crystal Palace). West Ham really attacked well in the second half. But they, to a man, were not conceding again. They were throwing bodies in the way of shots, Bilic must be made up with that. Incredible. There were signs early on in the second half after two great balls from Aaron Cresswell. Then they get the goal and from that it's a different game, different team, different attitude, different tempo, different intensity - everything was different. All of a sudden they found themselves ahead in a game that in the first half they were not remotely in. Mark Noble throws his shirt into the fans, all of the West Ham players have done in fact. A fan tumbles out of view as he leans to try and catch it! West Ham captain Mark Noble tells Sky Sports: "Being 2-0 down not only against Spurs but any team is a massive mountain to climb. "We have not been doing ourselves justice but I said during the week we have to wear the shirt with pride and we did that. "You need a bit of luck and Andre Ayew was in the right place for the two goals." Imer Cardona: Bilic definitely has the players's support. It's not over the top to say that could change West Ham's season. It takes a result like that to inspire you. Nobody was expecting that. We were talking at half time whether Slaven Bilic would even be in a job by the weekend? 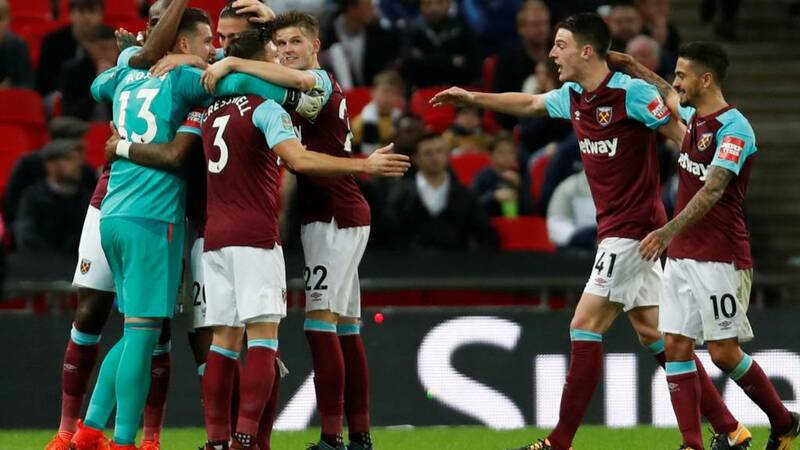 Yes, it may 'only' be the League Cup but the scenes in the away end show just what this win means for West Ham and their fans. Can't fault the endeavour against a Chelsea B Team but we need an experienced manager not Unsworth.